October is nationally recognized as Domestic Violence Awareness & Prevention Month; a time to celebrate survivors, honor those who have died, raise awareness, and confirm our commitment to preventing intimate partner violence in our community. We sponsor a number of events throughout our service area and encourage everyone in the community to get involved. 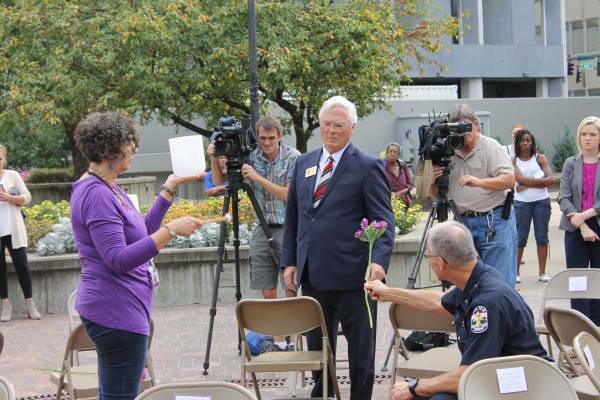 LMPD Chief of Police Steve Conrad hands a flower to Mike O’Connell in a moving ceremony to remember those who lost their lives to Domestic Violence. Check our calendar of events and follow us on social media to keep up with our awareness events this month.